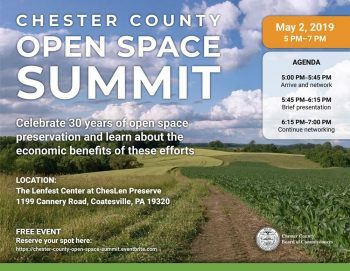 Chester County residents are invited to attend a celebration that will mark the 30th anniversary of the open space preservation program in this county and recognize the economic benefits of these efforts. The Chester County Open Space Summit will take place from 5 p.m.-7 p.m. Thursday, May 2, 2019 at the Lenfest Center at ChesLen Preserve, 1199 Cannery Road, Coatesville. Chester County was the first in the region to formally set aside funds for a rigorous open space preservation program and has now determined the economic value of the existing open space. This event will celebrate the economic value of protected open spaces—public parks, preserved farmland, and private conserved lands—and show the proven and substantial economic, environmental, and public health benefits to surrounding communities.